Posted April 15th, 2019 by Mobile Music School & filed under Benefits of Music Education. Welcome to our new music education series, where we will ask teachers why music programmes should be kept in schools. 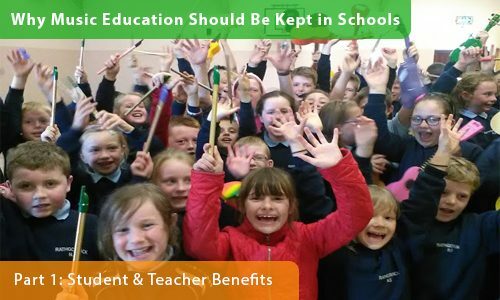 In previous series we discussed the benefits of music education and why it matters. This week we will look at importance of continuous music programmes in schools and how weekly music lessons benefit both the students and the teachers. 1st class primary school teacher CJ talks to us about the benefits our music programmes have on his class and on himself as a teacher. The students benefit from our weekly music lessons as MMS tutors actively engage every student in the learning process. This fun-filled, interactive approach to music education positively changes children’s attitudes to music and learning. Not only do music programmes benefit the students, but they also introduce teachers to new teaching methods that they can use for future lesson plans. Why Music Education Should Be Kept in Schools – Part 2: Active Learning coming next week!